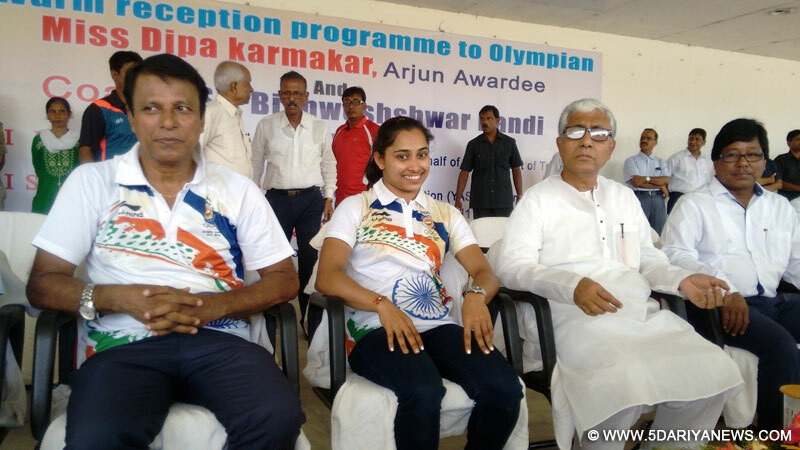 The Tripura government on Monday gave a rousing reception to ace gymnast Dipa Karmakar, the first Indian to take part in an Olympic gymnastics final, missing out on the bronze by a whisker.Hundreds of fans, officials, followers, admirers and well-wishers received Dipa and her coach Bisheshwar Nandi at the Agartala airport on their arrival from New Delhi.A motorcade of hundreds of vehicles and two-wheelers took to the streets here before a huge colourful reception ceremony was held at a city stadium to honour the "pride of the state". "I will try extremely hard to get gold medals in the forthcoming Asian Games (2018 in Jakarta), Commonwealth Games (2018 in Australia) and 2020 Tokyo Olympics. I shall try to deliver my best in future," said Dipa, who set a record by becoming the first Indian gymnast to qualify for Olympics in 52 years. "I would have been happy if I had got a medal at the Rio Olympics for the country. I will try heart and soul to get medals at the Tokyo Olympics and other future international events," she told the media. Later, at the reception, the 23-year-old Tripura girl, who at the final event scored 15.066 points, a mere 0.150 less than eventual bronze winner Giulia Steingruber (15.216) of Switzerland, said: "I apologise to my countrymen for not getting any medal in the Rio Olympics. But I'll definitely get medals in future international meets. "Praising her coach Nandi, she told the gathering to great applause: "Foreign coaches are not always the best; Indian coaches are also capable of delivering the goods. "The government and every one must take forward the initiative of 'Beti Bachao, Beti Padhao and Beti Khelao' to motivate girls to develop themselves,"Tripura Chief Minister Manik Sarkar, who led the reception for Dipa and her coach, announced her promotion from sports officer to assistant director and of Nandi from assistant director to deputy director of the Tripura government's sports and youth affairs department. Demanding an immediate announcement of sports and youth affairs policies by the central government, Sarkar said that if the Centre does not support the state by providing funds, the state, from its limited resources, would build an international-standard gymnastics coaching centre in Tripura.Tripura Education Minister Tapan Chakraborty declared a holiday on Tuesday at all educational institutions in the state in honour of Dipa. "In independent India, Dipa is the first Indian woman to take part in the Olympics and also, in the final event, do the risky Produnova vault in artistic gymnastics. Not getting medal is not a big issue, it is historic that she took part in the final event," Sarkar said. "Dipa is cool-minded, energetic, hard-working, sincere. She will sit for her MA examination from Tuesday. I believe she will do better in this test too," said Sarkar, himself a sports lover.He urged the central government to announce sports and youth policies, build sports infrastructure to find hidden talent in the country. Tripura Sports Minister Sahid Chowdhury reminded the gathering that just as Dipa was preparing to qualify for the Rio Olympics, the Gymnastics Federation of India had split into two groups due to an internal feud.The Tripura government had sought the intervention of the union sports ministry and it was only then that Dipa's trip to Rio was cleared, he said. "The Tripura government would arrange all international-standard apparatus and infrastructure for Dipa and other upcoming gymnastic and sports talent in Tripura so that they bring laurels for the state and the country at national and international events," he said. "We want to make many more Dipas in Tripura. Already, two young gymnasts from the state -- Asmita Paul and Avishek Saha -- have won medals at various national and international meets," the minister added.Agartala municipal corporation mayor Prafullajit Sinha, coach Nandi, Dipa's father Dulal Karmakar, first coach and Nandi's wife Soma Nandi, and her mother Gauri Devi, among others, attended the ceremony.Over 300 school students performed a dance and drill at the packed Swami Vivekananda Stadium.